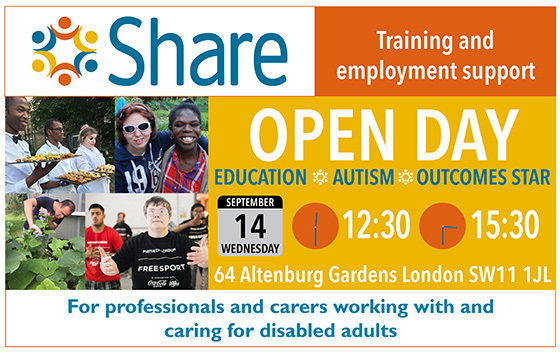 Come and learn more about Share and our training and employment services for disabled adults. This event will focus on our work with students with autism, and how we our tailoring our curriculum according to the specific needs of our students. The event is open to professionals working with disabled adults, as well as carers and potential students looking to take their next step, and is an opportunity for everyone to find out more about the services we provide. As well as learning about our core accredited training programme and our social enterprises which provide pathways into employment, you'll hear about Share's journey to becoming an autism-accredited organisation and how the Outcomes Star is helping us to shape our future curriculum to tailor it for the changing needs of our students. The Open Day will start with lunch at 12.30pm prepared by Share Catering.